What are your reflections on Christmas? This is mine. My brother-in-law came to Ohio for Thanksgiving, and stayed at our house for a couple of days. He wore this shirt and I didn't understand the equation, but the question interested me. 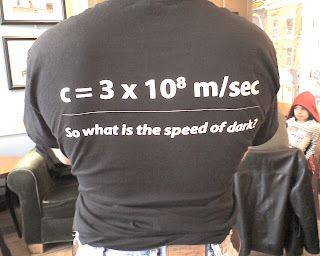 He went on to tell me that the equation is the speed of light, which makes the shirt make sense. "This is the message we have heard from him and declare to you: God is light; in him there is no darkness at all. If we claim to have fellowship with him yet walk in the darkness, we lie and do not live by the truth. But if we walk in the light, as he is in the light, we have fellowship with one another, and the blood of Jesus, his Son, purifies us from all sin." I remember in college someone explaining verse 5, in that in the greek when it says "in him there is no darkness" as being a double negative. "in him there is no, no darkness". Which means there is absolutely no darkness, only light. Jesus is light, and if darkness is the absence of light, then there is no darkness in him. So that got me back to thinking about the speed of dark. The speed of dark is faster than the speed of light, because it has to get out before the light gets there. They cannot be in the same place at the same time. It is impossible. So how fast is Satan and his cronies, I am not going to say that he is faster than God, but it is impossible for him to be in the same place as God, and when God is around, Satan is doing his best to get out of dodge, because he knows that there is no way he can compete with God. Are there some areas in which you need to invite God into your life to get rid of the evil that exists. Just remember, God will be victorious, so give it to him. Think about your church, family and neighborhood, where does Satan need to be run out of? What are you going to do about it.